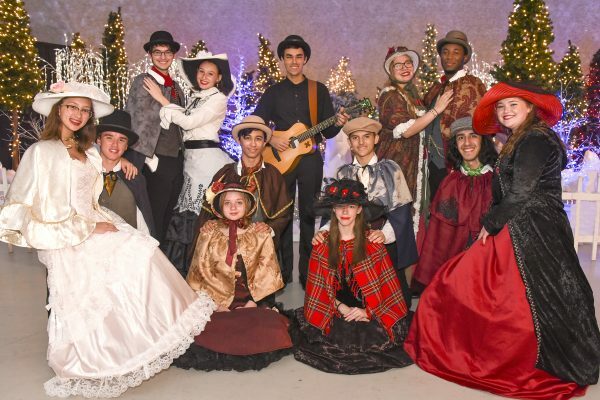 Riverview’s Victorian Christmas Carol singers make their debut at Christmas Lane in Plant City Sunday, Dec. 2. The school’s Chorus Department brought four shows to Plant City Sunday night with Harmonix, Vision, a combined choir and the carolers performing. And they will be doing all of this while carrying a full load of studies at high school. New this year is the Victorian Christmas Carol group, a new feature for the Riverview Chorus Department. Completely kitted out in authentic Victorian-era clothing the 12-person choir of six boys and six girls will perform songs from the late 1800s. Freedom Fairways Golf Course covered the cost of the elaborate costumes, a project taken on by Amy Burch, a choir mom. “She took on the project of costuming the kids, and their costumes are beautiful and authentic,” said Stewart. The project is personal for Stewart. The youngest of four siblings, she lost a sister, dad and two brothers. Her mother died in 2013.